Exploring South Africa's national parks and taking a wildlife safari are both easily accessible activities from Johannesburg. Whichever adventure you choose, be on the lookout for all of the Big Five animals (lion, leopard, rhinoceros, elephant, and Cape buffalo). Here are your options for wildlife tours from Johannesburg. Enjoy a thrilling African safari experience on a Pilanesberg Nature Reserve tour and get the chance to spot Africa's Big Five from an open-top safari vehicle. As well as elephants, lions, leopards, rhinos, and water buffaloes, the game reserve is home to giraffes, zebras, warthog, and blue wildebeest, so make sure you have your camera ready. Most Pilanesberg safaris also include a visit to the nearby Sun City Resort and Casino. It’s possible to experience South Africa’s oldest national park on a morning game drive or a full-day safari, but to really explore the vast Kruger National Park, you’ll need a multi-day tour. Wildlife hot spots include Blyde River Canyon and the Panorama Route, where possible sightings include roan antelope, zebra, hippopotamus, impala, and of course, the Big Five. Learn everything you ever wanted to know about elephants at the Elephant Sanctuary in Hartbeespoort Dam, home to a herd of domesticated African elephants. Visitors can participate in interactive workshops, help bathe the elephants, or take an elephant walk through the jungle, all under close supervision from experienced handlers. Book a tour for round-trip transportation. You’re guaranteed a big cat sighting at the Ann Van Dyk Cheetah Centre in Hartbeespoort Dam. The conservation and breeding program is home to cheetahs and African wild dogs. See Africa's fastest mammal in action during a guided tour of the reserve or join one of the daily feeding round tours. Located in nearby Gauteng province, the Rhino and Lion Nature Reserve makes a popular choice for a day trip. You’ll spot white lions, spotted hyena, and white rhino on an open vehicle safari, and pay a visit to the animal crèche, hippo pools, and vulture hide. Visitors who have more time can cross the border and spend a night at a safari lodge in Botswana's Chobe National Park, home to large numbers of Cape buffalo, elephants, and lions, as well as an incredible variety of birds. Alternatively, opt for an action-packed, 5-day tour from Johannesburg and combine it with a visit to Victoria Falls in Zimbabwe. See the majesty of South African wildlife with a full-day tour of the Pilanesberg Nature Reserve from Johannesburg. Travel through the reserve in an open-top 4x4 safari vehicle. Keep an eye out for the famous 'Big Five' – elephants, lions, leopards, rhinos and water buffaloes – as well as many other species. Eat lunch (included) and then choose to either do another safari drive or visit the nearby resort at Sun City. The Pilanesberg National Park is home to Africa’s Big Five—lion, leopard, rhinoceros, elephant, and Cape buffalo—and is an around 2.5-hour drive from Johannesburg. On this full-day tour, increase your chance of wildlife sightings with two guided game drives in an open safari vehicle, tuck into a delicious lunch looking out over a popular waterhole, and perhaps spot giraffe, hippos, zebras, and antelope in their natural environment. Just north of Johannesburg, the Pilanesberg National Park is home to Africa’s Big Five—lion, leopard, rhinoceros, elephant, and Cape buffalo. On this tour, maximize your chance of spotting all five on a thrilling three-hour safari with an expert guide. In the afternoon, learn more about South Africa’s cultural heritage and traditions during a visit to the Lesedi Cultural Village. Go on a game drive at Pilanesberg Nature Reserve to look for Africa’s ‘Big Five,’ then head for the famous Sun City resort to relax and enjoy the pools, casinos, and cultural village. This combination covers the best of two different tourist attractions in one day trip from Johannesburg. This tour allows visitors to walk side by side with African elephants on this 1-hour guided stroll through the bush. With keepers accompanying you, you'll learn about the biology, behavior, and conservation status of these large mammals. Lunch in the game park's lodge and a return drive through the Cradle of Humankind are included, as well as convenient pickup and drop-off in Guateng. Set out from Johannesburg to seek out Africa's 'Big Five' in Pilanesberg National Park. This full-day private tour includes both a morning and afternoon safari in either on open-top or closed vehicle, depending on your preference. Keep an eye out for various other wildlife, including cheetahs, giraffe, zebra and crocs as you go. Enjoy lunch next to one of the park's watering holes, where elephants, warthog, and blue wildebeest tend to gather. Then its back out across the park's rugged landscape on another unforgettable game drive. Spend about 3 hours viewing game while on a private safari at Kruger National Park during this 16-hour day trip from Johannesburg. Your game drive includes possible spotting of the Big Five: lions, elephants, buffalos, leopards, and rhinos. You'll find a picnic spot for lunch provided by your registered guide, with round-trip hotel transport also included. Experience the splendor of Pilanesberg National Park on a day trip from either Pretoria or Johannesburg. Set out on a safari through this popular game reserve, keeping an eye out for the park's 'Big Five' as well as impalas, cheetahs, hippos and crocodiles. The park is also known for its diverse bird life, which includes over 360 recorded species. Savor a delicious lunch at one of the onsite lodgings before returning mid-afternoon to your hotel. Spend the day exploring Pilanesberg National Park on this full-day tour from Johannesburg. With round-trip transportation included as well as a 5-hour game drive in an open-top safari vehicle, there's no need to rent your own car. Just sit back and enjoy the scenery on the journey and keep focused on the landscape for glimpses of native animals while in the park. This whirlwind day tour is perfect for those short on time who want a full safari experience. Benefit from personalized attention and a flexible itinerary on this half-day tour of the Lion Park, located conveniently about an hour's drive from both Johannesburg and Pretoria. Make the most of your time on this efficient tour that includes round trip transportation and a game drive; no need to wait for a large group to get moving. Listen to guided commentary while exploring the park, home to spotted hyena, cheetah, and some rare white lions. Embark on a South African safari without having to travel far from Johannesburg. This all-inclusive tour includes two ranger-led game drives in Pilanesberg National Park, home to elephant, lion, rhino, buffalo, leopard, zebra, and giraffe. Includes lunch and round-trip transfers from your Johannesburg hotel. The gigantic Kruger National Park is one of the best places in South Africa to see the Big Five. On this overnight tour, maximize your chance of spotting them all with two guided game drives in an open or closed safari vehicle (depending on option selected). After a thrilling day of wildlife watching, tuck into dinner around the campfire and sleep in a tent beneath the stars. Experience the beauty of Africa on a visit to this 1200-hectare park that's home to more than 700 rhino, lions, buffalo and other wildlife. Enjoy an opportunity to see some of South Africa's majestic wildlife with this 8-hour guided safari in the Rhino and Lion Reserve from either Johannesburg or Pretoria. See animals such as lions, rhinos, cheetahs, and wild dogs in a reserve roughly 1-hour from both Johannesburg or Pretoria. Know that while the animals are not roaming free, they have large spaces in which to live. Increase the possibility of seeing Africa’s elusive ‘Big Five’ game animals with a full day of safari drives in South Africa’s massive Kruger National Park. Explore the bush plains from an open-top 4x4, driven by an expert ranger, who will help you see as much wildlife as you can during two game drives. Stop at a game lodge for lunch at midday (own expense). Transport to and from lodges in Hazyview are included with this full-day tour. Head into the wild on this Pilanesberg safari in an open vehicle. Experience the beauty of nature up close and the ease of private transport on this tour that includes bottled water and lunch. Join fellow travelers for a three-hour game drive in in one of South Africa's premier nature reserves. Short on time in Johannesburg but keen to do a game drive? 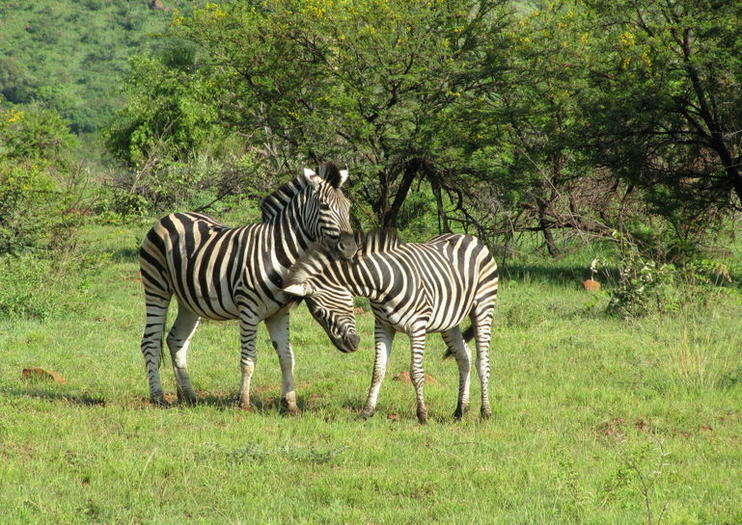 Then this full-day small-group tour to Pilanesberg National Park is ideal. An easy day trip compared to Kruger National Park, Pilanesberg is home to around 7,000 animals, including the 'Big Five' (lion, leopard, buffalo, rhino, and elephant), and over 300 bird species. On arrival, take a game drive to observe the wildlife and scenery. Hotel pickup and drop-off, entrance fees, and lunch included. The Rhino and Lion Nature Reserve is a private game reserve located less than an hour from Johannesburg and known for its breeding programs. On this tour, enjoy a guided safari drive around the park; spot animals including lion, white rhino, cheetah, Siberian tigers, and hippopotamus; and look out for lion cubs and white rhino calves. Track lions, rhinos, leopards and more on an early morning game drive through Kruger National Park. Set out in an open-roof 4x4 through the African bush and across vast open plains to view some of the world's most incredible wildlife in their natural habitat. Look for grazing zebras and lumbering elephants, and keep an ear out for eagles and vultures that may be circling overhead. You may even spot a hippo! This 6-hour tour is one big photo op so have your camera ready.